Another mouth watering bread recipe from your humble Smoking Tava kitchen. The classic Italian loaf can be enjoyed as a sandwich or an accompaniment to hot soup or pasta. I had made cheesy garlic bread slices out of this wonderful recipe. Unfortunately couldn't capture any photographs of the garlic bread for reasons beyond one's control :). Cold water - 1 tbsp. In a bowl, add milk and water, dissolve the sugar and yeast in it. Leave the yeast mixture for around 10 minutes. Whisk in the oil, add salt. Take flour in a large bowl, form a well in the middle, add the yeast mixture little by little, keep mixing the flour with the help of a fork. Use the dough maker if you have one and run it on medium speed. You can also use a hand blender with kneading attachment. If you feel the mixture is quite loose, cover it with a damp towel and leave it for couple of minutes before you start working on it again. Dust a flat surface with flour and knead the dough thoroughly on the surface to activate the gluten. Do this for around 10 minutes. Leave the dough in a bowl, cover it with a damp cloth for 3 - 4 hours (depending on the weather; yeast requires warm and humid surrounding conditions to do its thing and rise the dough). Your dough would have now doubled (or even more) in size. Lightly dust a flat surface and knock out all the air from the risen dough, knead it couple of times. Split the dough into two equal portions and shape it to form two lovely Italian loafs. Lightly dust baking tray and place the dough in it. Cover the tray with a damp cloth and leave it to further rise for around an hour. Meanwhile, pre-heat oven to 180º C. The dough would have nicely risen by now. Lightly make few slanting scores with a sharp knife or blade. Please take care, the loafs are quite sensitive at this point. Mix the egg white and cold water in a bowl mix well to make a simple egg-wash. With the help of a pastry brush, lightly brush the egg-wash on the loafs. 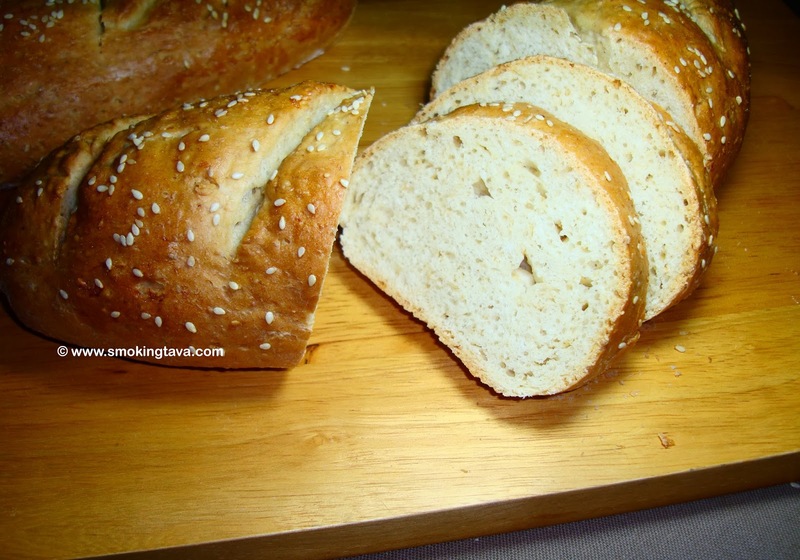 If you would like, you can sprinkle some sesame seeds on top of the loaf. 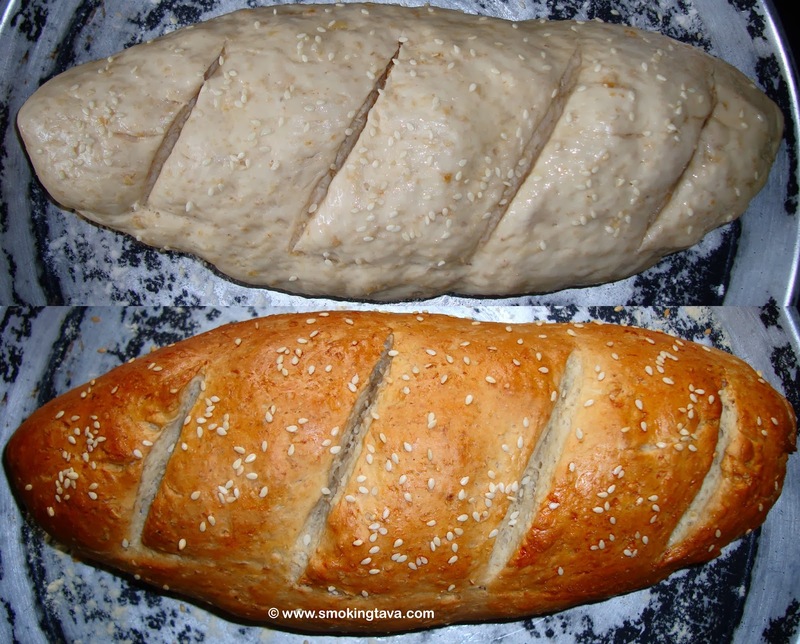 Bake the loafs for 35-40 minutes @ 180º C.